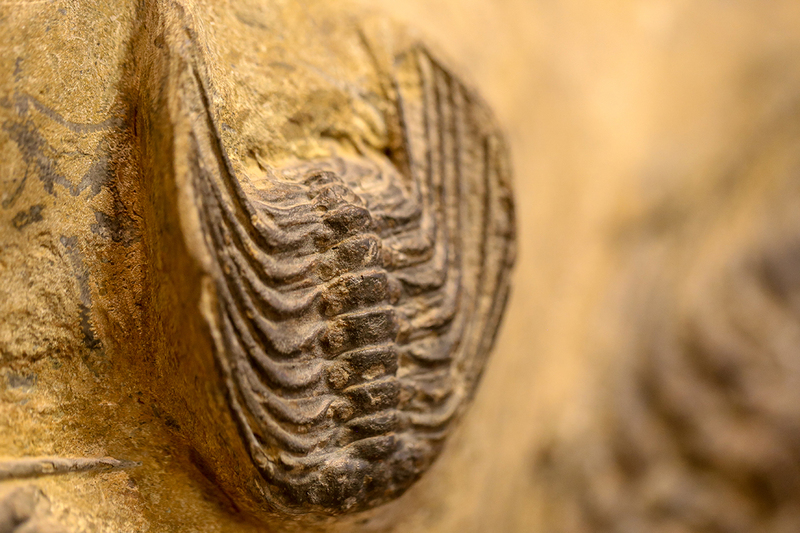 The oceans were once filled with trilobites, ancient animals that are some of the first creatures with hard parts found in the fossil record. A giant slab of rock preserves a natural gathering of three types of trilobite, as well as many brittle stars. Calymenella is a trilobite that existed during the Upper Ordovician in what is now France. Selenopeltis is the largest trilobite on the slab. Its name derives from its long lateral spines. They lived during the Ordovician period, 479–444 million years ago. Dalmanitina was a small trilobite that had a semicircular head, with long lateral spines extending from the side of their head. Their large eyes contained around 700 separate lenses. 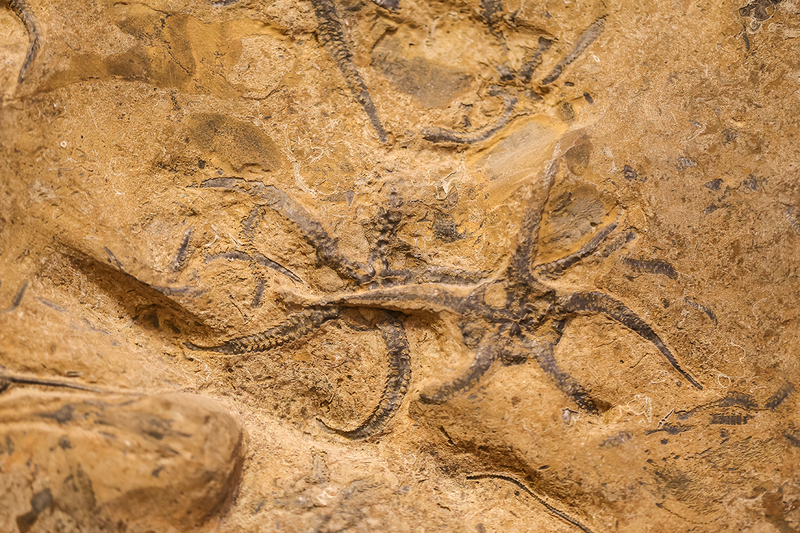 This beautiful 'brittle star' Ophiuroidea, with all five arms intact and radiating from the central disc, is just one of the many specimens you can view on the trilobite wall. Trilobites are arthropods, a group of animals that includes spiders, scorpions, crustaceans and insects. This slab of sandstone comes from Tinghir Province, Morocco, and is about 450 million years old. 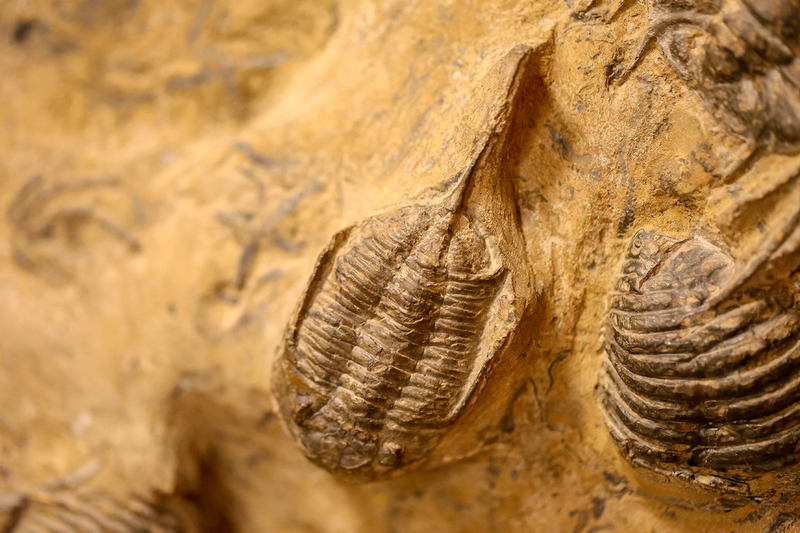 It is a fantastic natural assemblage, containing the trilobites Selenopeltis, Calymenella and Dalmanitina. These animals lived on the floor of an ancient ocean and their remains were brought together after death, probably by the action of sea currents. The gigantic Selenopeltis is the most common genus of trilobite on the slab, and is characterised by a series of long spines along its body. Calymenella is large, dome-shaped and with no spines; Dalmanitina is smaller, with a large spine extending backwards from the end of the tail. It is likely that these trilobites were predators or scavengers, feeding on small invertebrates or their remains, or detritivores that fed on decaying matter on the seafloor. The spiny armour of Selenopeltis was undoubtedly protective, possibly against the large, predatory squid-like creatures and fish that had evolved by this time. 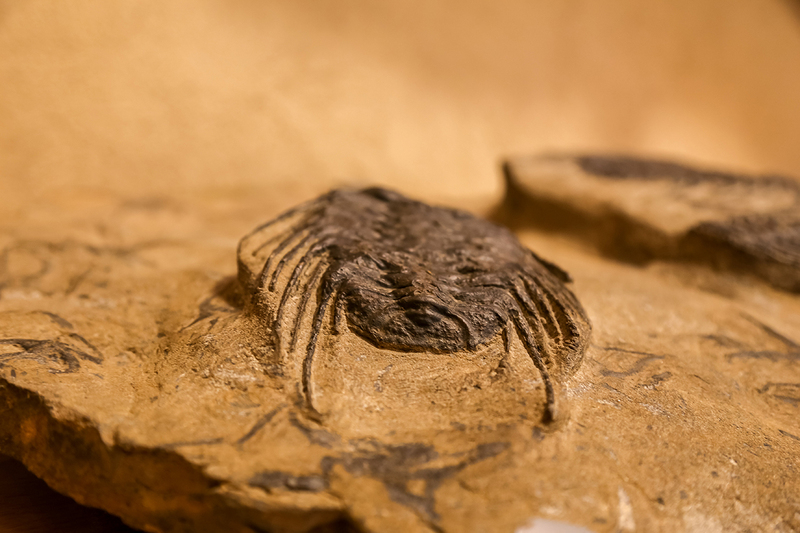 The rock dates from the Ordovician Period, which ran from around 485 to 444 million years ago, and ended with a mass extinction thought to have been brought about by relatively rapid climate change. Cooler climates generated a great ice sheet centred on the South Pole – at the time occupied by the land that is now northern Africa – which spread almost completely around the Earth. Many species found it difficult to adapt to these changes; Selenopeltis, Calymenella and Dalmanitina all died out. 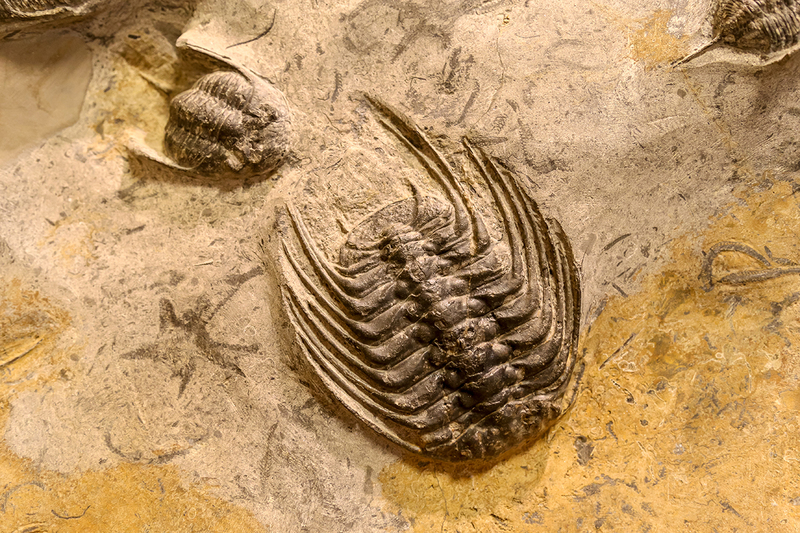 A number of trilobite families survived this mass extinction and continued to roam the seafloors until about 250 million years ago, when all trilobites became extinct. 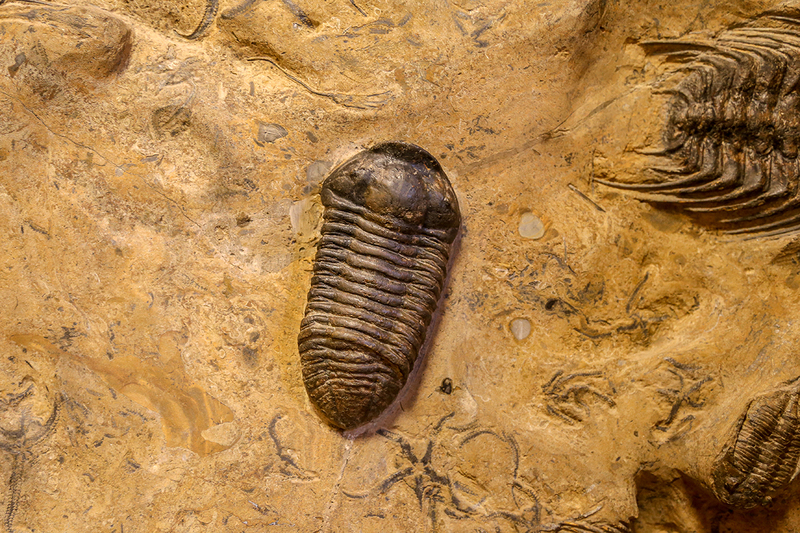 Trilobites are a group of extinct, marine arthropods that first appeared around 530 million years ago, shortly after the beginning of the Cambrian period and lived throughout the majority of the Paleozoic Era, for nearly 300 million years. This particular trilobite specimen (Acaste inflata) was collected and named by John William Salter during the Ledbury Railway Tunnel cutting in 1864. Was the Cambrian really an evolutionary explosion of different animal groups, or is the lack of evidence from earlier periods due to some peculiarity of the fossilisation process? The debate has rumbled on for a number of years.